Fresh sugarcane is used in a number of cuisines around the world, especially in Southeast Asia and other tropical climates. 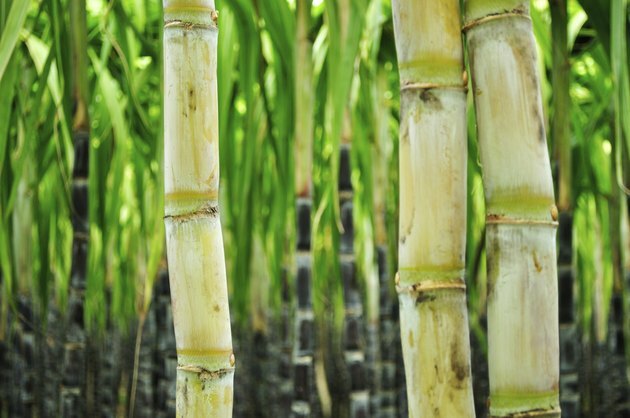 Sugarcane can be consumed fresh in stalks or, more commonly, as a refined sugar or a juice. Sugarcane, particularly when it has not undergone a heavy refinement process, offers a number of nutritional benefits, making it a healthy alternative to refined white sugar. When raw, sugarcane is a naturally low-cholesterol, low-sodium food that contains no saturated fats. A 1-teaspoon serving of raw sugar derived from sugarcane has only 15 calories per serving, although it contains no dietary fiber, fat, cholesterol or sodium. While it is a low-cholesterol food, sugarcane still contains a significant number of calories in proportion to the serving size. Eat sugarcane sparingly to avoid accidentally consuming too many calories. The glycemic index is a measurement of how quickly a food will raise blood sugar levels. The highest rating on the glycemic index is 100, the equivalent of glucose or white bread. The lower the glycemic index is, the less effect it has on blood sugar spikes. Sugarcane juice is the part of the plant that is actually consumed or sucked out, as whole sugarcane is very fibrous. According to "Organic Lifestyle Magazine," sugarcane juice has a glycemic index of 43, which, according to the American Diabetes Association, makes sugarcane a low-glycemic food. Sugarcane -- whether in sugar, syrup or juice form -- is a good substitute for refined white sugar, although sugarcane should still be eaten sparingly. The reason sugarcane has a low glycemic index is because sugars derived from plants are processed in your liver, not your small intestine. This means that the sugars from sugarcane -- fructose and glucose -- are more slowly absorbed than sucrose, thus reducing the likelihood of blood sugar level spikes. Produced from sugarcane, blackstrap molasses is not as common a sweetener as it was during the pioneer days, but its health benefits are numerous. A single tablespoon contains 58 calories, and it is a good source of calcium, iron, magnesium and potassium. A 1-tablespoon serving contains 41 milligrams of calcium, almost 1 milligram of iron, 48 milligrams of magnesium and 293 milligrams of potassium. The same-sized serving contains almost no fat and no cholesterol. For the greatest health benefits, consume minimally processed sugarcane juice. This means you consume less sugar per serving while still receiving all the nutritional benefits of sugarcane. Fresh sugarcane juice can be made at home if you have a juicer. Or you can purchase it at specialty grocery stores. The less processing and the fewer preservatives and added ingredients it has, the more health benefits you'll likely receive. If you are interested in consuming whole, fresh sugarcane, purchase large, precut pieces of fresh sugarcane. Choose pieces of sugarcane that are still firm when touched, with a smooth, unbruised bark and no visible mold. Fresh sugarcane can be stored in the refrigerator for up to six months. American Sugar Alliance: Is There a Difference Between Sugar Produced From Sugar Beets and Sugar Produced From Sugar Cane?